Marilee Sprenger is a highly regarded educator, presenter, and author who has taught students from prekindergarten through graduate school and has been translating neuroscience research into practice for more than 20 years. The author of 11 books and numerous articles, Sprenger is a popular keynote speaker who has engaged audiences throughout the United States and internationally. A member of the American Academy of Neurology, she stays abreast of the latest brain research and is passionate about brain research–based teaching strategies that incorporate differentiated instruction, work with the brain's memory systems, and wire the brain for success. She believes in teaching to the whole child and providing brain-compatible learning environments. 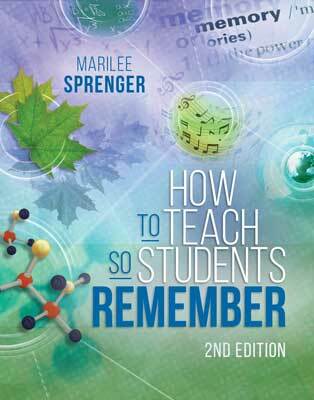 This second edition of Sprenger's celebrated book offers seven concrete, actionable steps to help students use what they’ve learned when they need it.